A Stevens Point woman is back behind bars on a $4,000 cash bond after a judge determined she had violated the conditions of her release. Kari Sittig, 33, pleaded not guilty Nov. 26 to 13 charges including manufacturing/delivering methamphetamine, possession with intent to distribute methamphetamine, conspiracy to deliver more than 50 grams of methamphetamine, maintaining a drug trafficking place and human trafficking. Eleven of the charges are felonies; two charges of neglecting a child/party to the crime are misdemeanors. According to court records, the harm specified in those charges did not occur. Sittig was arrested by Stevens Point police in late August after investigators reported finding more than 23 grams of meth in her Fourth Ave. home. According to the criminal complaint, Sittig was at work when police arrived with a search warrant and found her children, 15 and 8, home alone. Assistant District Attorney Cass Cousins told Judge Robert Shannon on Monday that Sittig was now facing additional charges in Portage Co. and new charges in Monroe Co., arguing Sittig should be held on a $10,000 cash bail because she’d violated conditions of her bond. During Sittig’s Aug. 30 bail hearing, Portage Co. Judge Thomas Flugaur ordered if Sittig made bail, she not possess or consume controlled substances without a valid prescription, not possess any drug paraphernalia, and not to associate with any persons possessing or consuming illegal controlled substances. She was released on a $1,000 cash bond and $4,000 signature bond on Sept. 4. Cousins argued there was clear evidence Sittig had been in possession of a controlled substance, based on her late October arrest in Monroe Co., where she allegedly sold two grams of meth to an undercover narcotics officer. “I think that forfeiture of bond is absolutely required by law due to the new criminal charges the defendant faces,” Cousins said. Sittig’s attorney Nicole Muller argued that a preliminary hearing for Sittig’s Monroe Co. charges hadn’t been held yet, so there was no ruling of probable cause that her client had committed a crime. In that case, Sittig was released Nov. 1 on a $5,000 signature bond. “These are only allegations,” Muller said of the Monroe Co. case. Cousins called Stevens Point Detective Aaron Yenter to testify during Monday’s arraignment. Yenter is part of the Central Wisconsin Drug Task Force; a specialized network of 14 law enforcement agencies that work cooperatively on narcotics cases. Yenter testified that Sittig continued communicating with the undercover officer after being arrested in Portage Co. and eventually arranged to sell the officer meth in Tomah, Wis. Initially, Sittig claimed she was able to sell the undercover officer more than 50 grams of meth, Yenter said, but she was only able to produce two grams on Oct. 29 during a controlled buy in the parking lot of the Tomah Walmart. Yenter described the two grams as “collateral”, adding Sittig told the undercover officer she would obtain the additional meth from someone in the Minneapolis/St. Paul area the following day. Yenter said Sittig was taken into custody before she could make that trip. 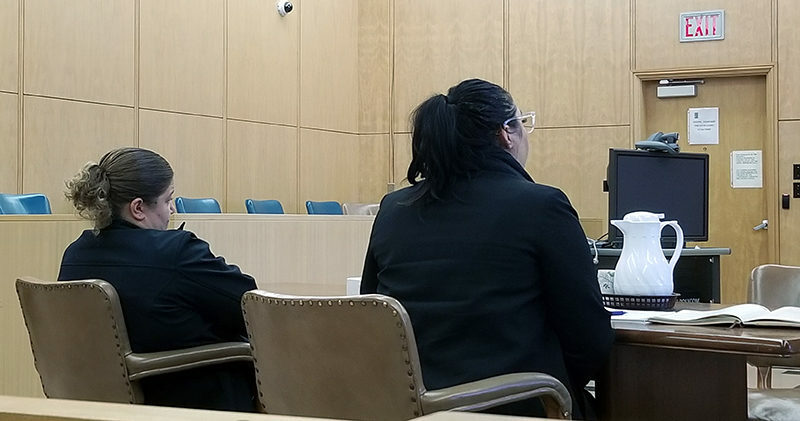 Sittig’s lawyer argued Yenter didn’t personally witness much of what he testified to, also questioning whether officers maintained a proper chain of evidence. Muller asked Yenter if the undercover officer “might have obtained a different bag of methamphetamine” between the controlled buy with Sittig and the time a Tomah police officer conducted a chemical reaction test used by law enforcement to identify narcotics while in the field. Muller argued the high cash bond was an undue burden, saying Sittig has never missed a court date and has ties to the community. Sittig is currently collecting unemployment and responsible for paying “a pretty significant chunk of change” in child support, Muller said. Judge Shannon said the 16-page criminal complaint from the Monroe Co. case, along with Yenter’s testimony, was enough proof in his mind that probable cause did exist that Sittig had violated conditions of her bond. “Based on her ignoring the current conditions of bond, and apparently $1,000 (cash bond) was not sufficient to motivate her to do so; that is very, very concerning,” Shannon said. Shannon ordered Sittig’s $4,000 signature bond be modified to a cash bond, and that she report drug- and alcohol-free five days a week to the Portage Co. Jail Day Report Center. Sittig’s initial appearance is scheduled in Monroe Co. on Dec. 10, and she returns to court in Portage Co. Jan. 28 for a pre-trial conference.